It’s not just multi-million pound companies and pharmaceuticals that are at risk of corporate espionage. If you are a leader in your field, the chances are someone will want to know how you did it; and they might not stop at legal means to find out. Read on to find out whether your offices are in need of a security sweep. The most obvious sign that it is time to take some counter surveillance measures is when confidential information has been leaked and is in the hands of your competitors. However, by this point, it is often too late to prevent much of the damage and you are left having to try and prove that the information was gained illegally. Luckily, however, there are smaller signs, and if you spot them in time, they could stop the spy in their tracks. One of the key things to look out for is staff members acting oddly; this could be anything from being found in areas of the building they don’t need to be in to suddenly placing plants on desks around the office. Of course, this could be happening for a number of other reasons, but it is worth noting. Other indicators that you may need a bug sweep include a break-in where little or nothing has been taken, or the sudden appearance of visitors you weren’t expecting. For example, your security firm turn up to check your alarm system without you reporting a fault or it being due for a test. The same is true of smoke alarms and detectors, electrical engineers, or even the sudden appearance of a plumber. If you didn’t call them, or schedule the visit, then be suspicious of bugs. If any of these occur and raise questions in your mind, then it is time to organise a security sweep with the professionals at Advanced Sweeping. We work confidentially and can fit around your company’s needs. 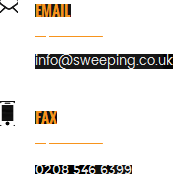 Visit http://sweeping.co.uk/ to learn more about the counter surveillance services we provide, and then message us through our contact page to see what we can do for you.